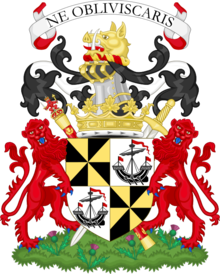 Archibald Campbell, 1st Duke of Argyll, 10th Earl of Argyll (25 July 1658 – 25 September 1703) was a Scottish peer. The eldest son of Archibald Campbell, 9th Earl of Argyll and Mary Stuart, daughter of James Stuart, 4th Earl of Moray, Campbell sought to recover his father's estates (by gaining King James II's favour). However, after failing to do so, he supported William and Mary's quest for the throne; this important support led to the monarchs returning his father's estate. Also, he was made a Privy Councillor. He was William's chief Scottish advisor, and was colonel-in-chief of the Earl of Argyll's Regiment of Foot, that was involved in the 1692 massacre of the MacDonalds of Glen Coe, but took no part in any of its field operations. He was made a duke in 1701. The 1st Duke of Argyll is buried at Kilmun Parish Church. Stephen, Leslie, ed. (1886). "Campbell, Archibald (d.1703)" . Dictionary of National Biography. 8. London: Smith, Elder & Co. This page was last edited on 9 April 2019, at 05:07 (UTC).